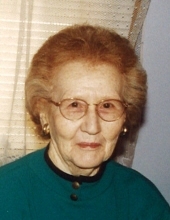 Frances C. Curley, 100, of Terre Haute passed away Tuesday, January 22, 2019 in Providence Healthcare. She was born April 16, 1918 in Woodbury, GA to Glover Taylor and Fannie Belle Walton Taylor. Survivors include her daughter, Jane Curley; son, William G. Curley; grandchildren, Amanda Rushbrooke (James), Jennifer Ferres (Gregory), Paul A. Melton, and Corinne Cuffle (Harry); and six great grandchildren. She was preceded in death by her husband, William S. Curley; her parents; and brothers, Everett Taylor, John C. “Buck” Taylor, and Walter Taylor. Frances was a member of St. Benedict Catholic Church. She was a former member of the Elks Women’s 9 Hole Golf League. Frances was a loving grandmother and she loved being around family and friends. The family would like to give special thanks to the Sisters of Providence and Bill Erney for their kindness and care. Mass of Christian Burial will be at 11:00 a.m. on Saturday, January 26, 2019 in St. Benedict Catholic Church with Father Fred Pasche, OFM Conv. officiating. Burial will be in Calvary Cemetery. Visitation will be prior to services from 9:00 – 11:00 A.M. in the church. Arrangements are under the direction of Callahan & Hughes Funeral Home, 605 South 25th Street. In lieu of flowers donations may be made to the Sisters of Providence at St. Mary of the Woods or St. Benedict Soup Kitchen. To send flowers or a remembrance gift to the family of Frances C. Curley, please visit our Tribute Store. "Email Address" would like to share the life celebration of Frances C. Curley. Click on the "link" to go to share a favorite memory or leave a condolence message for the family.